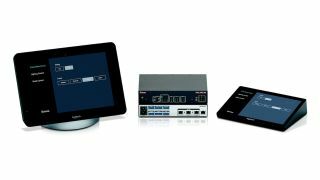 The What: Extron AV control can now be part of Logitech SmartDock and Tap collaboration spaces. Extron’s work with Logitech through the Logitech Collaboration Program allows the extension of automation and control integration capabilities to a modern workspace. The What Else: In addition to the Extron on-screen control interface, meeting rooms can integrate video signal detection and occupancy sensors to automate video switching, lighting, and display presets. Extron and Logitech scalable collaboration solutions are designed for enterprise deployment and can be maintained with Microsoft SCCM, System Center Configuration Manager. "This is an exciting time, as Extron and Logitech have combined complementary technologies to provide powerful, turn-key collaboration solutions for the modern meeting space," said Casey Hall, vice president of worldwide sales and marketing for Extron. "Logitech SmartDock and Logitech Tap are automating the meeting experience for huddle spaces or any environment that can benefit from the convenience of combined communication and powerful AV room control." The Bottom Line: The Logitech SmartDock, and soon, Logitech Tap, can be equipped with Extron control systems, audio signal processors, and digital video switching and distribution for a fully integrated, unified collaboration solution. Meeting attendees will benefit from an expansion of meeting collaboration features while enjoying the convenience of AV room control, all from a familiar user interface. Extron Control for Logitech SmartDock is available now, and Extron Control for Tap will be available soon.